Limpio, habitación cómoda, algo ruidosa por estar junto a una calle de mucho tránsito, tren y aeropuerto. Con estacionamiento y desayuno que se sirve temprano lo que es bueno para los que estamos de viaje. Bem localizado, próximo do aeroporto e centro. Apesar de pequeno é bem confortavel. Where to find Gravatai hotels near an airport? Where can I find hotels in Gravatai that are near tourist attractions? 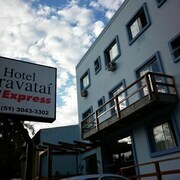 Are you after accommodation in downtown Gravatai? 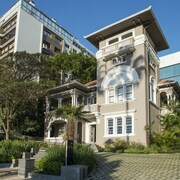 There are 2 Expedia-listed hotels and apartments located within a 0.1-kilometre (0.06-mile) distance of the downtown area. There are a number of Expedia-listed hotels within a 10 kilometres (6 miles) radius, including the Hotel Intercity Gravataí and InterCity Shopping Gravataí. 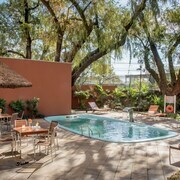 You could check out the Radisson Hotel Porto Alegre and the Hotel Laghetto Viverone Moinhos. 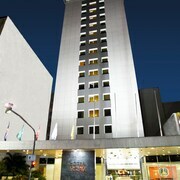 The Radisson Hotel Porto Alegre can be found 30 kilometres (18 miles) from the main part of Gravatai. 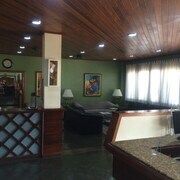 The Hotel Laghetto Viverone Moinhos, is situated 30 kilometres (18 miles) away. 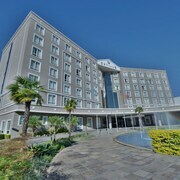 The Sheraton Porto Alegre Hotel as well as the Hotel Express Confort are two other recommended Expedia-listed accommodation options in Gravatai. Looking to travel a bit further afield? South Region has a number of options. South Region is marked by beaches and coastal plains. Commonly visited South Region tourist attractions are ruins and traditional villages. In this part of Brazil tourists might partake in hiking, picnicking and beach combing. 30 kilometres (20 miles) away from Gravatai you will find Downtown Porto Alegre, where visitors can enjoy Museum of Contemporary Art Rio Grande do Su and Communications Museum. 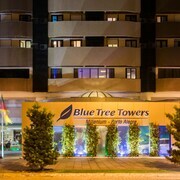 Downtown Porto Alegre hotels include the Coral Tower Express and Quality Hotel Porto Alegre. Or stay in Hamburgo Velho, 30 kilometres (18 miles) to the northwest of Gravatai, where you'll find the Locanda Hotel and Hotel Express Executive. While visiting Hamburgo Velho, set aside some time to check out the National Shoe Museum and Comunidade Evangelica Hamburgo Velho. If you are into sports and love watching local games you could take a trip to Beira-Rio Stadium, which is 35 kilometres (21 miles) to the southwest of Gravatai. For those who are interested in booking accommodation nearby, make a reservation in the Comfort Porto Alegre or Harbor Hotel Regent Suites. Salgado Filho International Airport is located 25 kilometres (15 miles) from Gravatai. If you wish to stay nearby, you can book a room at the Hotel Deville Prime Porto Alegre or the Holiday Inn Porto Alegre. What are the most popular Gravatai hotels? Are there hotels in other cities near Gravatai? What other types of accommodations are available in Gravatai? Explore Gravatai with Expedia.ca’s Travel Guides to find the best flights, cars, holiday packages and more!